In July this year, Google made an important announcement regarding its mobile ranking factors, saying that page speed will be a significant factor in deciding page ranking on its mobile SERP. So, what does this announcement really mean in terms of the SEO efforts you must make, so as to make sure this update doesn’t derail your business in any way? First off, is the Google update on page speed, an update at all? If you’re thinking that ranking on Google had always been dependent on factors that included page speed, you’re right, but only half right. 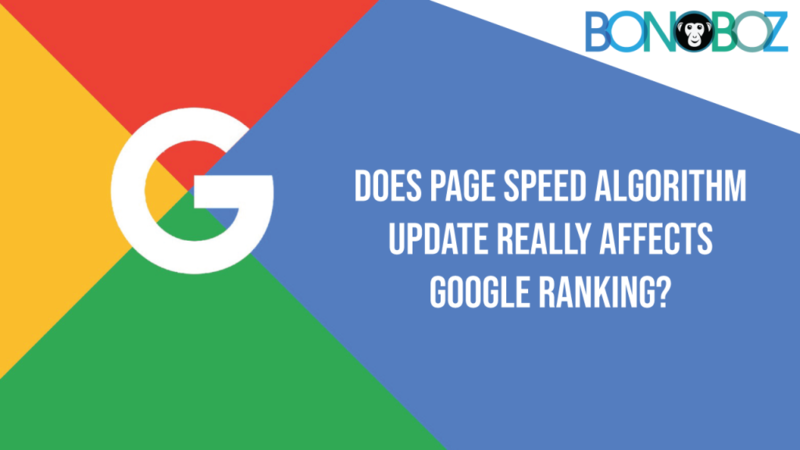 Since 2009, Google’s ranking algorithm has already been taking page speed into account, but with signal focused only on desktop searches. But July 2018 announcement made the same thing official for mobile searches as well. While we now know that your website’s place in the competition will highly depend upon the how fast the other sites in your niche are, Google has made it clear that the relevance of content is still very much an important ranking factor. That means, even if your site is a bit on the slower side, it might still rank higher if the content you posted is relevant to its audience. So, you don’t always have to worry about some funny memes dragging down your important content on the search result page. Switching to AMPs, that is Accelerated Mobile Pages can cut down the page load time by 15% to 85%, as seen in initial Google testing. While you might lose some control over your page design, and it’s obviously not a solution without its cons, it’s still worth a shot if you want to create mobile experiences that are super-fast. Queries on a desktop and on a mobile, are quite different from each other. While search queries have become more and more conversational with time, queries on mobile phones are still simpler in nature. And simplicity is the primary driver of speed. You want to check out “How is Americano different from Espresso”, and on mobile you go, “Americano v… ”, or “Americano vs Esprsso” and it automatically completes to, or becomes “Americano vs Espresso”. Now, if your website then has a page that gives an answer to the question, with page ranking say, second or third, your SEO team should ensure the page loads at a lightning speed. How can you check your landing page experience in Google Ads? First off, you log into your account on Google Ads. You see a bar to your left? Select the option ‘Keywords’ in there. Next, find the status column, and look for any single keyword by hovering over the visible text. A pop will soon emerge, where you have to focus on the last part, that’d say something on the lines of, “landing page experience”. If this part further reads “Average” or “Above Average”, you have nothing to worry about. But let’s say, it says “Below Average”, then this window will have a list of certain factors mentioned above. It’s very much possible, that the problem would be your page speed, especially if all your keywords are well in their places. Relevant content, with the right keywords featuring predominantly, and in a way that each keyword expresses its intent properly. Like, a low-intent keyword instead of being used for an important product demo, could direct a user to merely a low-stakes download, and so on. Make sure your site’s navigation is simple. Don’t let it have many pop-ups, and don’t bury your product information or CTA particularly on mobile sites, where pages have lesser space than their desktop counterparts. Decrease page load time by considering using AMPs or any other way you might see fit to achieve the goal. People should be able to trust you and your brand. So, provide information on your previous accolades, and buttons to your social media pages as proof for and promote your business’s competency. It might not be easy, but it sure is simple. Being a Google Ads user, you have to make sure you observe and optimize the speed and load time of your landing page. Relevance matters a lot, but it’s not the only thing that does. Especially, if your site is too slow, even relevant content won’t be able to help it after a while. Most of all, keep thinking of ways to leverage the power of Page Speed and Search Console insights, as much as possible.